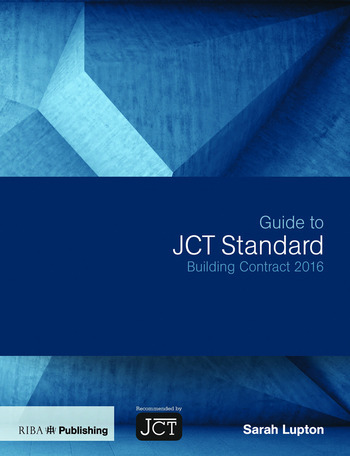 Guide to JCT Standard Building Contract 2016 is a practical guide to the operation and administration of JCT’s SBC 2016 suite of building contracts (SBC/Q, SBC/AQ and SBC/XQ). All of the contracts’ provisions, procedures and conditions are organised and explained by subject, clearly distinguishing the different obligations due to various parties and the contractual issues arising during the course of a job - all backed up by the latest legislation and case law. Professor Sarah Lupton (MA, DipArch, LLM, RIBA, Carb) is a practising architect and specialist in design liability and construction contract law. She is course director for the Diploma/MA in Professional Studies at Cardiff University and runs three practice modules in the BArch and MArch degrees. She is also an adjudicator, expert witness and chartered arbitrator.